This "TRUE LOVE" Sterling Silver Stackable Ring Set is currently selling for just $9.99 on Amazon.com! You will be saving 80% off the listed price of $49.99 with this jewelry deal. 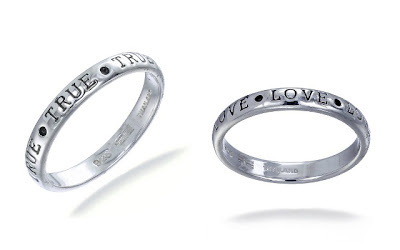 What I like about this ring set is the message it sends with the words stamped on each ring. They can be worn by two different people or stacked together on one finger. At this price, if you can't find the right size, you could buy these rings to hang from a silver or white gold necklace! This items is eligible for Free Shipping with a $25 purchase or with an Amazon Prime account.